Purposefully to a New Touchstone – What's for Dinner Moms? Rather than make resolutions for the past few years I have chosen a guiding word that I try to focus my mind and energy on each year. My guiding word for this year has been purposefully. It was the word I chose last December to be the guiding force for my decisions and life this year. I really liked having the word to reflect on several times during the year to keep checking myself to see if I was living my life the way I wanted to, purposefully. As this year is coming to an end and I am looking towards the New Year I am thinking of what my word will be. I have several ideas. Maybe motivated. I am searching for a word to propel me forward this year. I felt last year’s word was perfect to slow down and think about what I was doing and the state of the world as it felt like it was changing. This year I want a word that moves me. Inspires me. I just looked up synonyms for motivated. Ambitious. Aspiring. Zealous. Enthusiastic. Those are all great possibilities. Do you choose a word for your year? Have you chosen a new one yet? This is a great idea. In the past year I can see where “focused” directed my thinking and actions. I didn’t choose that word however. The saying “Be the change you want to see in the world” inspires me now, but I don’t have that distilled to one word, at least not yet. Thank you! I love that quote! I see where the challenge is – is there one word that can capture your passion and/or goals in many areas of your life? Yes! I am trying to keep it higher level to cover all areas. But haven’t hit the perfect word yet. That’s a great word! I try to do check-ins about once a quarter. I have my weekly, monthly and yearly goals right in my calendar. Sometimes I make it sometimes I don’t but the are always right in front of me. I like the idea of having a specific guiding word for a year! It helps me focus if I can have one word rather than a lists of I want to…..
That’s right! It is easier to focus on one “subject” than having a whole list. 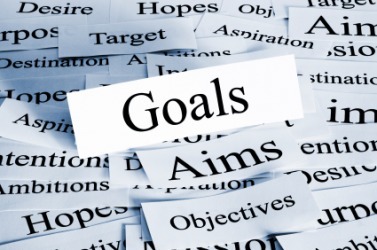 You won’t get anything on the list done but focusing on one goal helps to reach it. What an intriguing post – I’ve never thought about a word for the year. I have so many things that I want to focus my life’s purpose on – family? love? committed (more for work)? Hmmm…something to mull over between now and the end of the year… Great idea! Thank you! Maybe a word that could focus on them all? Purpose? Intent? 🙂 There’s more chance of me managing it than if I chose a more healthy word. “Be the change you wish to see in the world.” That declaration can be reduced to the word “exemplify”. I do not make resolutions. But I love the idea of picking a “guiding word”. I may give that a thought! I am fairly disciplined which is why I do not do resolutions. But the guiding word for your year is interesting! What a great alternative to resolutions!